To meet all your hair needs. Come see us to find the perfect length for you! We are pleased to offer clients several hair care product lines. We carry: Enjoy, Moroccan Oil, Aquage, and Bain de Terre. We are also pleased to announce we now carry HALOCOUTURE! Stop by and browse our growing selection! We now carry Cannabidiol-based products (also know as CBD products) from Charlotte's Web, Ananda Hemp, and Meditative Medicinals. We offer CBD tinctures, topicals, and capsules as well as other CBD products. See the CBD products page or drop by to learn more. Browse the site--find us using the Location page. Meet the stylists using the navigation menu above. Don't forget to 'like' us on our Facebook page and drop us a line. 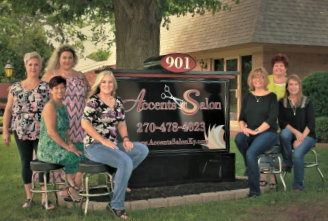 Thank you for visiting the Accents Salon website!